Book 1: Davidson County Tennessee (elder reprint) PLUS Whitfield Index to Clayton's History… (two books). Author: Clayton. 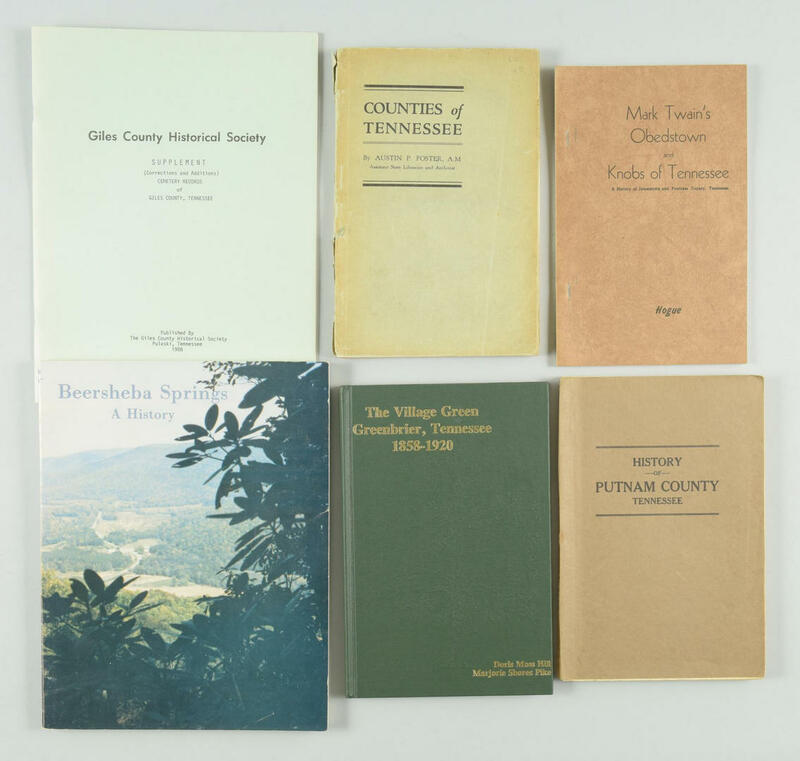 Book 2: Putnam County, Tennessee, 1850-1970. Author: DeLozier. Book 3: Along the Warioto. Author: Beach. Book 4: Mountain Voices. Author: Waldrop Book 5: Carroll County, Tennessee. Author: Turner. 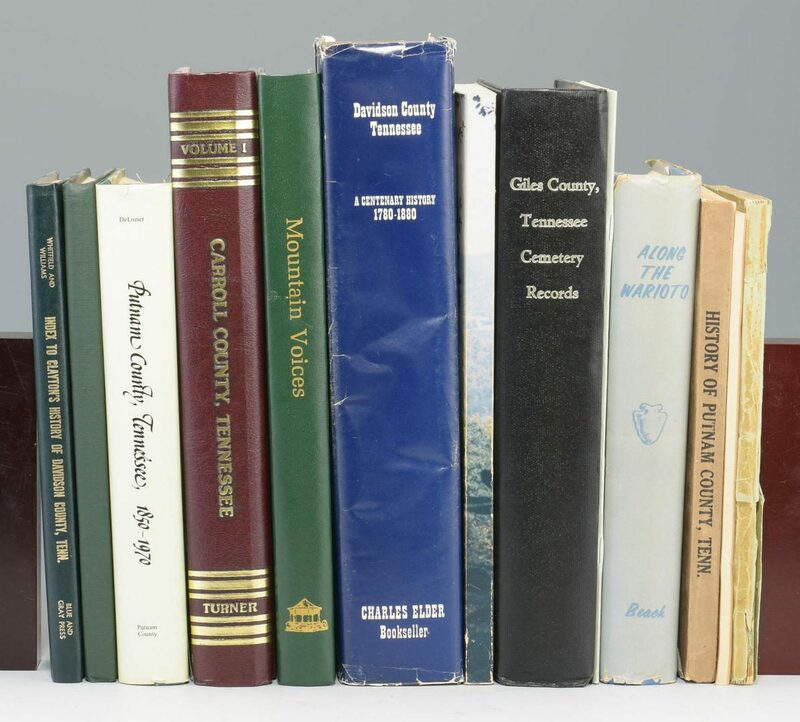 Book 6: Giles County, Tennessee Cemetary Records. Author: Giles County Historical Society. Book 7: History Putnam County. 1925. Author: McClain. Book 8: Mark Twain's Obedstown and Knobs of Tennessee. Author: Hogue. Book 9: Beersheba Springs; A History. Author: Coppinger et al. Book 10: Counties of Tennessee. Author: Foster. Book 11: Village Green Greenbrier, Tennessee 1858-1920. Author: Hill and Pike. Book 12: Supplement to Giles County Cemetary Records (thin stapled). Author: n.a. Books range in size from 8 7/8" H x 5 3/4" W x 1/8" D to 12" H x 9" W x 2 3/8" D. Collection of Charles and Ann Wells, Nashville, Tennessee. CONDITION: All books in good to very good condition except for Foster. Counties of Tennessee which is disbound with wraps present.